Jacob Wheeler hauled in a stringer full of smallmouth today and took over the lead at the Bassmaster Classic. 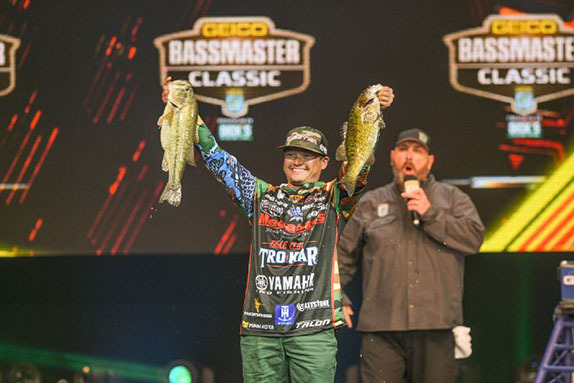 If there’s a better big-game player in the sport of bass fishing than Jacob Wheeler at the present time, he'd better stand up now. Otherwise, Wheeler seems poised to solidify his place among the greats in the game. 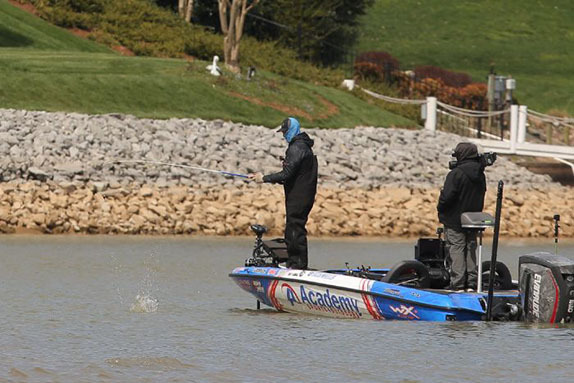 After posting a solid 14-11 stringer on Friday to begin the Bassmaster Classic, Wheeler hauled 17-11 out of the Tennessee River today to catapult himself into the lead with one day of competition remaining. 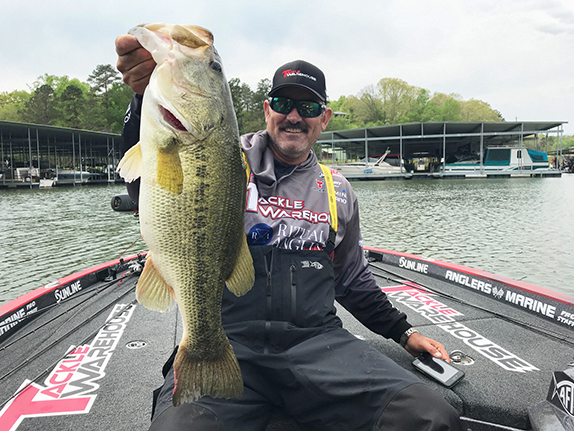 His 32-06 total after two days has him just eight ounces clear of his nearest challenger, good friend and roommate Mark Daniels Jr., setting the stage for a pressure-packed final day at Fort Loudoun-Tellico lakes. 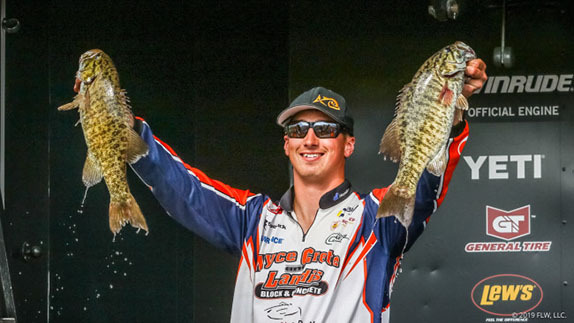 It’s far from a slam dunk – the top 5 are separated by less than four pounds – but if Wheeler puts together another strong day and closes out the win tomorrow, he’ll become the sixth angler to capture a Forrest Wood Cup and Classic – and he’s only 28. He would also become the only angler to win those marquee events in addition to the BFL All-American, which he claimed in 2011. Wheeler’s résumé is far from top-heavy, though. He amassed seven top-12 finishes in full-field tournaments during his two seasons on the Elite Series, including a win at Lake Cherokee in 2017 and a runner-up showing at Lake Travis (Texas Fest) last year. He also won the Lake Chickamauga BASSFest tournament in 2014. In eight previous Cups and Classics, Wheeler has finished outside the top 10 just twice. 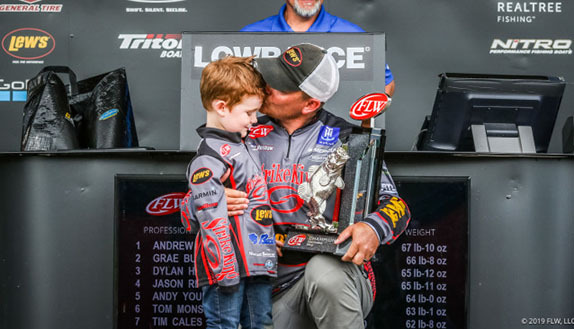 As much as Wheeler wants to add another significant piece of hardware to his collection, the group of anglers chasing him will be looking to build on big days. Daniels sacked 17-06, including a 6-03 largemouth, to move up four spots to 2nd with 31-14. Chris Zaldain, the only current Elite Series pro with a realistic shot at winning, caught a tournament-best 21-12 and rocketed up 25 places to 3rd with 30-12. Day-1 leader Ott DeFoe saw his weight nearly cut in half at 10-05 and slipped to 4th with 30-05. Mike Iaconelli, the 2003 Classic winner, put himself in contention with a 19-07 effort that moved him into 5th with 28-09. Moving baits have dominated the action so far and it doesn’t appear as though that’ll change for the final day. Conditions tomorrow will be ideal with abundant sunshine and highs in the mid to upper 50s with light winds out of the west. Only four spots in the top 25 changed hands today, with Edwin Evers (30th to 12th) and Seth Feider (32nd to 20th) joining Zaldain and Iaconelli in earning another day on the water. Tennessee natives Wesley Strader (6th) and Brandon Lester (21st) also made the cut. 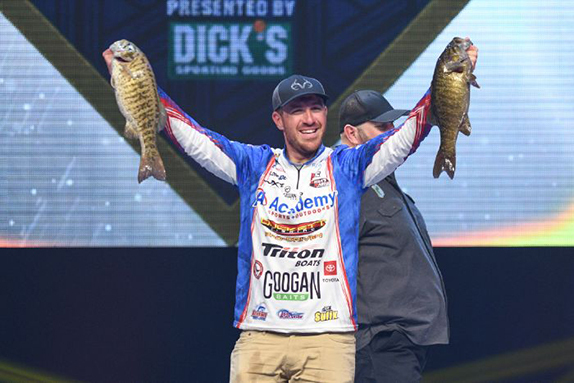 Two-time defending champion Jordan Lee saw his tournament come to an end after he caught just three fish for 5-04, sending him to a 42nd-place finish. Wheeler used moving baits to compile his stringer of brown fish. So what makes Wheeler so good when the stakes are raised and the lights are at their brightest? Today, he dealt with power issues in his boat prior to launching, then hit a log on the way back to check-in this afternoon, knocking off the lower unit of his motor. Brent Chapman then stopped and transported Wheeler and his fish back to the landing. Wheeler surprised himself by weighing in a limit of smallmouth, all of which had to satisfy an 18-inch length requirement. He caught them all fishing moving baits. After catching a couple of his day-1 fish off a stretch he’d found in practice, he discovered another productive area that produced three smallmouth. Today, he went back to it and caught a 5-pounder there. “They’re similar, but not the same,” he said. After averaging 16-plus pounds through the first two days, Wheeler will also be faced with putting a third straight strong day together on a fishery that is notorious for betraying anglers. He’ll have to hold off traveling partner Daniels to do so after Daniels finished his day on a high note. He’d been stuck on four fish up until he had about 10 minutes to go before he had to start heading back to Knoxville. That’s when he threw a white spinnerbait up close to a laydown and began slow-rolling it back. A 6-pound largemouth topped Mark Daniels Jr.'s day-2 haul that elevated him to 2nd place. The fish came up and jumped with its mouth wide open. Daniels frantically got the fish away from the log and swung into the boat. It came off the hook in mid-air and landed in the floor of his boat. As it did, Daniels danced on his front deck as though he’d scored the go-ahead touchdown in the Super Bowl. “I’ve put myself in great position to win and hopefully that’s what happens,” he said. He got a taste of the finicky nature of Lou-Tel today as he came up empty on areas that had produced bites on day 1. “My two best places from Friday, I didn’t get a bite today,” he said. “And a place I fished Friday and didn’t get a bite, I caught three of my fish there today. 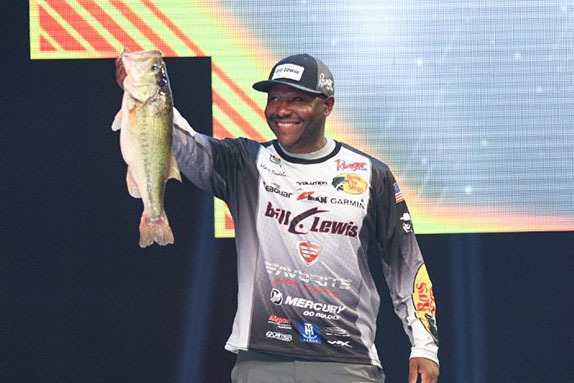 And now he’s got a chance to become the first African-American angler to win the Classic. Zaldain couldn’t have scripted a better follow up to his four-fish, 9-pound day on Friday. That’s because he followed a hunch he picked up Wednesday in the Tellico River, where he caught a 6-pound smallmouth flipping a laydown. “On paper, looking at the water temperatures going up and the water coming up, plus it’s springtime and I caught it in a creek, I said, ‘I’m going back up there figuring they’re coming to me,” he said. It didn’t materialize quite the way he imagined, so he reverted today to what he’d developed over the first three days of practice. And now he’s hoping the pattern holds up and carries him to the top. Chris Zaldain caught a mix of largemouths and smallmouths on day 2. DeFoe summed up the theme of his day by calling it the “struggle bus.” He’s grateful to still be in the mix, but he felt like today was a missed opportunity. He plans on covering a lot of water tomorrow and not staying in one spot too long without a bite. Iaconelli benefited greatly from the change in wind direction today and hopes to reap the rewards again Sunday. “I fished the same way, but the areas I’m fishing are reliant on current and that’s important to trigger bites,” he said. “On day 1, the wind blew against the current. We got beat up running back in. He said he’ll be returning to where he started today, hoping more fish have moved into the area. He said there’s an increased sense of urgency being in contention while knowing this could very well be his final Classic. The following anglers did not make the cut and will not fish on day 3.